Having criticized Martha Schwartz and long considered Will Alsop the ‘Clown Prince of Architecture’ I was curious to hear them discuss Alsop’s philosophical notion that ‘No landscape architect should ever get hold of these [landscape] commissions because they have completely institutionalized the idea of public space’. As you can see, Alsop’s main complaints against the landscape profession are (1) there are too many about (2) they do not know their trees (3) they are doing too much urban design and master planning (which Alsop would rather do himself?). Schwartz does a passable job of defending her turf but eventually blurts out the truth ‘You and I are very much alike in how we work’. It would also be interesting to hear Hitler and Stalin debating the philosophical notion that ‘Dictators should never be allowed to run countries’. They might even have agreed to design a Satellite Town – in Poland. I was sorry to hear Schwartz slagging off garden design. It is a fine art of the highest order and it has laid the basis for the world’s most admired urban designs: Isfahan, Rome, Paris, Georgian London, Beijing and Washington DC. I would also like to refer them both to my proposed definition of landscape architecture. Can anyone dispute that buildings must be designed in relation to landform, water, planting, and paving? Or that outdoor space should be beautiful, ecological and and socially useful? Are architects or landscape architects able to achieve this? Some are; some are not. Martha Schwartz seems better at aesthetic composition than at dealing with social and ecological issues. Alsop is a bozo: all sop with a dash of pop. This entry was posted in Garden Design, Historic garden restoration, Landscape Architecture, News, Urban Design on 30th January 2009 by Tom Turner. so we have our site! i’ve marked down a likely location for the wine bar area, and a couple of other things beside. the surrounding buildings cast a lot of shade. of course we’ve know way of knowing what time of day/year the image was taken, but can count on the bottom (south) end of the site at least getting less light. the right hand side of the site (which i’ve marked down as the formal entrance) could presently be used for parking. an annoyance depending on whether or not we decide to acknowledge it. also note how the building at the top of the site reflects a lot of light back into the site, creating patterns upon the ground. useful? This entry was posted in Garden Design on 26th January 2009 by Stefan. This inclines me to the view that, at present, the Greenway Concept has more public visibility. There are three problems with the Green Infrastructure Concept: (1) the literature is thin (2) it is unclear whether “green” means “vegetated” or whether it is used as in “green politics” (3) the term “infrastructure” is much better understood by the built environment professions than by the general public. London has many greenways. Some are excellent and others in urgent need of better landscape planning and design. 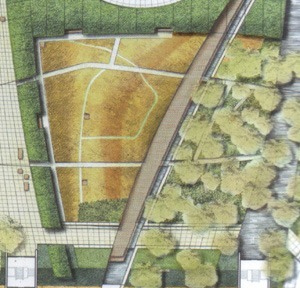 This entry was posted in Landscape Architecture, Public parks, Sustainable design, Urban Design on 24th January 2009 by Tom Turner. I attended the meeting of the Landscape Institute yesterday, held to discuss the future of the Library and Archive, which is threatened with disposal. Many people remarked on what a pleasure it was to have a general LI meeting – and what a pity that it had to have a negative objective: to stop the disposal of the LI Library. When I moved to London in the early 1970s there used to be regular general meetings of the Institute at Carlton House Terrace. A friend remembers playing musical chairs with Sylvia Crowe, Brenda Colvin, Cliff Tandy, Bodfan Gruffyd, and others. It was appropriate that Hal Moggridge, who also attended these meetings, was the first to speak in support of the Library and Archive. Since the Chapters/Branches were formed the community has lacked well-attended general meetings. Our predecessors would be pleased that the points made at the general meeting on 22 January 2009 were more positive than negative. There was strong support for the principle of retaining the Library and Archive in the ownership and custody of the Landscape Institute. To some, it felt like keeping family photographs: one may not look at them very often but one wants to know they are there. They are our heritage; they define our identity; they are the seed from which the organization will grow. There was strong support for the principle of re-directing the Landscape Institute’s administrative energy towards the exertion of influence on public policy. Having been urging this change since 1990, I was very pleased to hear people speak in its favour. The economic recession, which was officially recognized this morning, makes the task urgent. There is an appreciation that the LI Council and Secretariat have become detached from the membership. The LI is spending too much money on administrators. They are not landscape architects and they do jobs which used to be done by members working as volunteers. This is expensive and, as ever, a volunteer is worth ten pressed men or women. Here is my own suggestion: the LI should hold another General Meeting to formulate ideas and set the agenda with a series of Policy Statements, as Geoffrey Jellicoe did in the even darker days of the 1940s and 1950s. People can speak with passion at meetings, making the task of writing the policy statements simpler and faster. Instead of a few glossy documents on vague topics we should issue monthly press releases accompanied by two good illustrations and two sides of A4. The Friend’s Meeting House would be a good venue for a Policy Meeting. 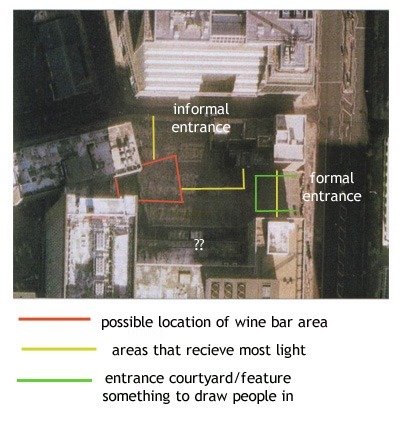 This entry was posted in Landscape Architecture, News on 23rd January 2009 by Tom Turner. The initial idea was to acknowledge the bleak surroundings [See Tom’s post ‘Barking Town Square’s Elder Brother‘] and compliment them with fine elements: crystallized glass and an enclosing wall of screens. The colour accent is an iridescent blue. This is to illuminate the night sky and to connect with colours in the deepest ocean. Warmer tones of apricot and honey-wood are used to balance the cool colours. At present they will be used to theme the day time appearance of the space with naturals and neutrals. Planting is used to soften the space and to define different sections, giving privacy and a sense of ambiguity as to whether the space is inside or out. The furniture is comfortable and modern. The sound mood is set by the music of the string quartet – a leisurely evening pace for sipping wine and conversation. The space is a moonlight garden or Moon Garden. All planting is white. At present the screens may be 1) actual visual screens in which case they can display any scenery or create any mood OR they may be 2) a projective surface OR 3) merely a textured surface. Conceptual elements further define the space. 1. A water curtain on the side of the building suggests a water fall over a cliff face – and can be used for visual screenings. 2. Vertical signage on a building identifies the space. 4. A central water feature, with a black base [see Ethel Anderson’s article on Moon Gardens], has an active inner pool and and a passive outer pool with planting. The outer pool is a flat rim; and the inner pool has with a wide but shallow V-sloped basin in solid stone. 5. There is perimeter bench seating – possibly white. Outdoor spaces have a long existence – which is a preferred as a sustainability strategy. 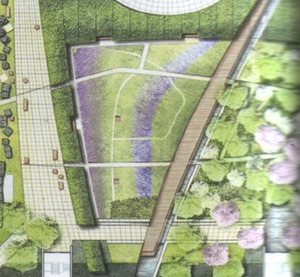 The design is conceived as a semi-public semi-park. It functions at night as a wine bar and during the lunch hour as a formal cafe space. The park elements need to be considered as permanent. While the cafe elements are temporary. 1. Exterior paving AND a removable wooden platform with rubber inlay for wine bars etc. 2. 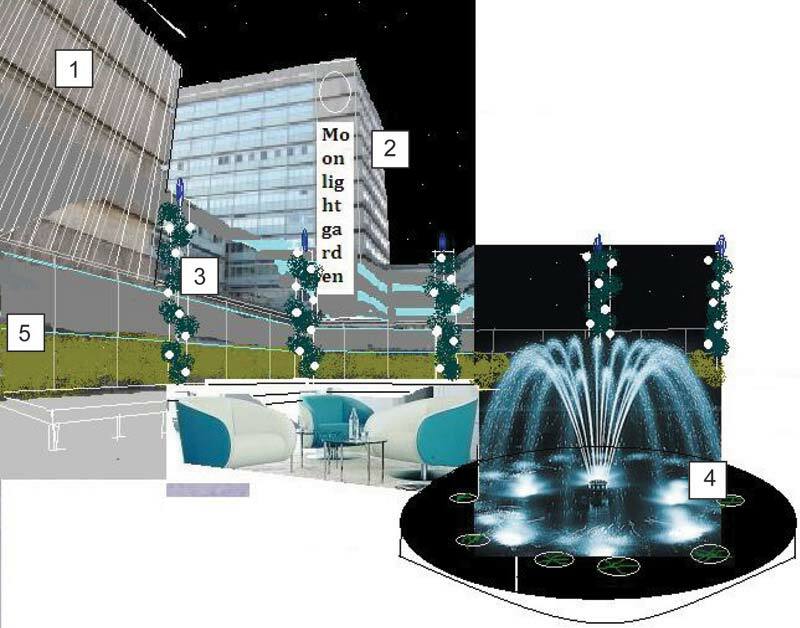 Permanent public lighting and seating for a Moon Garden. 3. Removable task specific lighting for the wine bar and seating islands. 4. Removable commercial seating islands for wine bar patrons. 5. Permanent planting for the Moon Garden. 6. Removable planting for lunch venues/wine bars. The space should be ambiguous: is it landscape or architecture; is it interior or exterior? Is it for day or night? Is it a park to be in or a space to eat in? This entry was posted in Garden and landscape products, Landscape Architecture, Public parks, Urban Design on 22nd January 2009 by Christine. to go along with the discussion about planting design raging below, i thought i’d post this as an example of what can happen when a good designer and a good plantsman work together. This entry was posted in Garden Design on 18th January 2009 by Stefan. A friend, who is both a designer and a plant expert, remarks that “a planting design should be done without reference to plant names”. Instead, “the designer should use sketches and cross sections” – and then think about what species could achieve the design effect. Though I accept the point that planting design is very much to do with colour, texture, mass, etc, I do not agree with the point. Think about furniture design: you need to know whether the item is to be made with steel, plastic, cast iron, oak, ash, birch or whatever, BEFORE the design can be started. So what are the principles of planting design? We published an eBook on the Principles of Garden Design in 2008 and, if time and inspiration permit, would like to follow it with an eBook on the Principles of Planting Design. Though unsatisfactory, it it tempting to conceive the subject in terms of historic approaches to planting design. My friend’s approach, I think, relates to the Bauhaus belief that there are certain principles of abstract design which, presumably, apply to any project in any time in any place. As Geoffrey Jellicoe wrote in 1925 ‘The bases of abstract design, running through history like a silver thread, are independent of race and age’. Modern planting designs are treated as abstract compositions which need only please the eye. But there is more to planting design and abstract composition runs contrary to the idea that ‘form follows function’. If one wants to grow cabbages or apples, or to engage in permaculture, then one cannot think about ‘the design’ in isolation from its function. 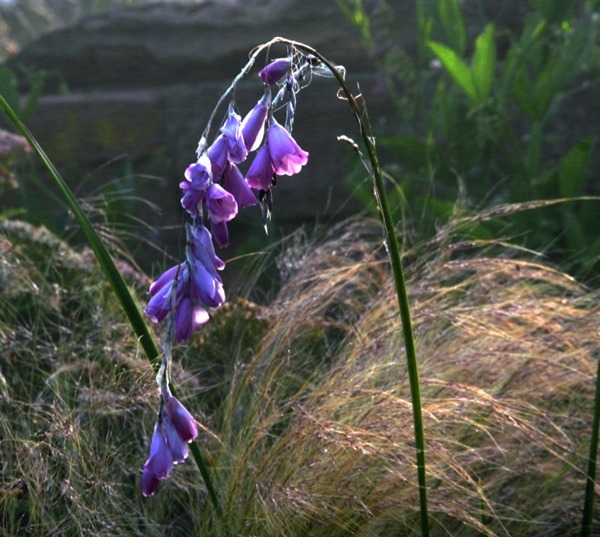 The photograph illustrates the point that “Dierama pulcherrimum is an elegant plant which looks well with the softness of Stipa tennusima“. But could this plant combination have been achieved by doing the design BEFORE thinking about the species? I asked the designer and learned that ‘ The Stipa was planted first and placed because I thought it was a place it would flourish. Then I walked round, some years later, with the Dierama in a pot – and thinking both where it would grow and what it would go with from a compositional point of view’. So species selection preceded aesthetics. This entry was posted in Garden Design on 12th January 2009 by Tom Turner. Congratulations to the Sustainable Sites Initiative for producing the best publication I have seen on sustainable landscape architecture, planning and design. They are inviting comments and you can use this link to download a free copy. 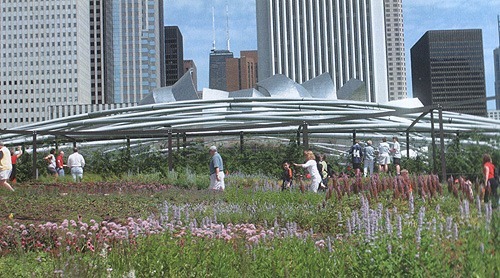 The Sustainable Sites Initiative is an interdisciplinary partnership, led by the American Society of Landscape Architects, the Lady Bird Johnson Wildflower Center, and the United States Botanic Garden. Good though the report is, my feeling is that the scientists have had a greater say in its production than the designers. The general public and the design community will only make a significant committment to sustainable landscape design when it looks right. It needs to become a ‘must-have-can’t-live-without’ commodity. Never having found much use for blue jeans, I am convinced that people buy 501s for their looks. I also suspect that people wear stilettos more for style than because they are so durable, comfortable and sustainable. 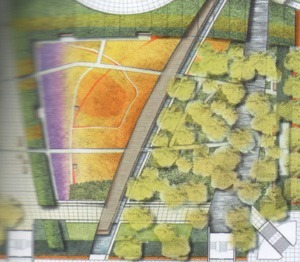 One of the ASLA contributions to the partnership should have been to ensure the report is packed with must-have images. 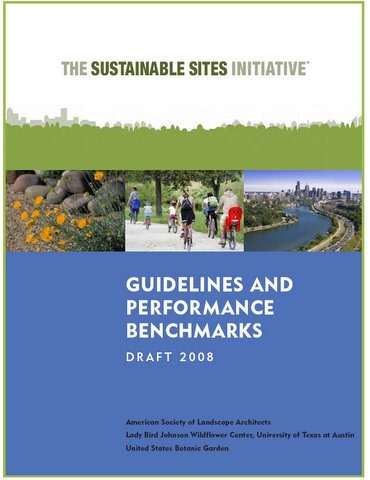 Even at this late stage, ASLA should find some far-superior images for the cover. I love cycling and cyclists – but I can’t see how they help sell sustainable landscape design. Ditto with wild flowers and riverside parkways. They exemplify good planning – but not exciting design. This entry was posted in Garden Design, Landscape Architecture, Sustainable design on 9th January 2009 by Tom Turner. This entry was posted in Garden Design, garden history on 4th January 2009 by Christine. Ueda Landform – Scottish Gallery of Modern Art design by Charles Jencks (Image courtesy Matt Riggott). This entry was posted in Garden Design, Landscape Architecture on 4th January 2009 by Tom Turner. Short-term thinking produces such horrors as the ‘useful quick-growing screen’, achieved (left) with Lawson’s Hated Cypress (Chamaecyparis lawsoniana ‘Horribilis’). 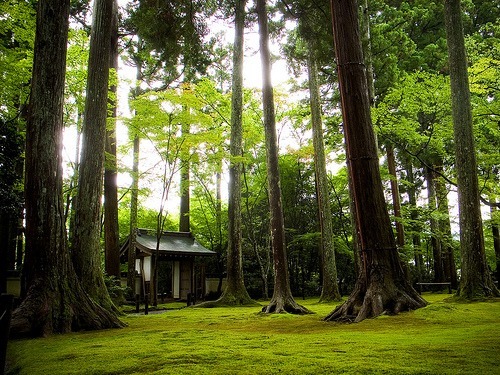 Long-term thinking produces such masterpieces as Katsura Imperial Villa (right). 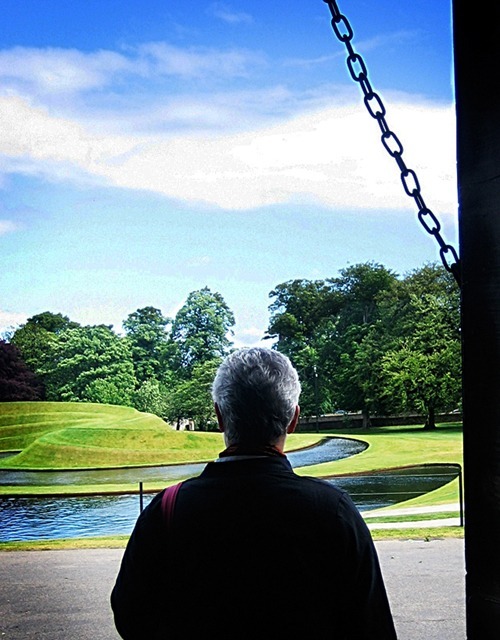 It is a sobering thought, for the highly trained professional designer, that most of the world’s best gardens owe their brilliance to the work of owner-designers – not to professional designers. One thinks of Katsura Palace, the Taj Mahal, Sissinghurst and Little Sparta. Then one thinks of all the billions spent on public parks in the twentieth century: they produced a few good designs, a mass of trash and nothing in the first order of excellence. Think of the Parque Juan Carlos I . It must make the poor old King of Spain think about abdication (or just about changing its name to Parque General Franco?). There is one outstanding candidate amongst many possible explanations for the problem. Professional designers think about making an impact on their immediate clients and their peers; owner-designers have often belonged to dynasties with a concern for the very long term future of their property in general and their gardens in particular. They combine the essentials of ‘ownership and control’ with a sense of duty to the past and duty to the future. Garden designers and landscape architects can assist only with help from enlightened patrons. To make better public gardens and landscapes we require very much better patronage. What can the modern world do? Reinstate primogeniture? Abolish inheritance tax? Bring back the aristocracy? This entry was posted in Garden Design, Landscape Architecture on 2nd January 2009 by Tom Turner. 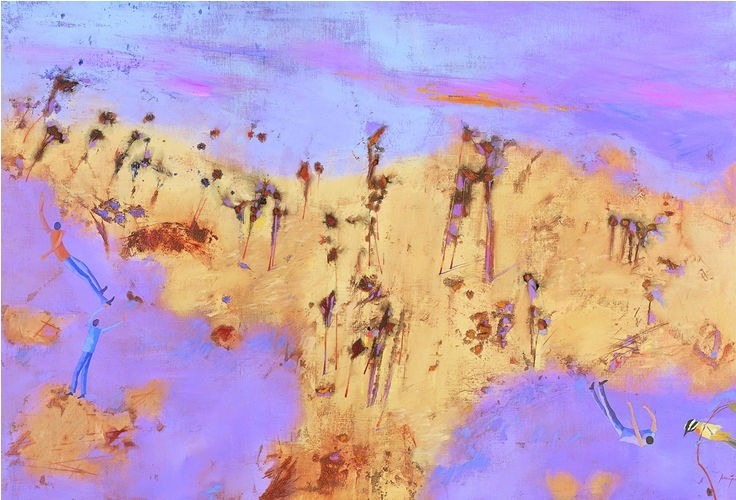 Most depictions of the desert are of a rather unhospitable place, yet this canvas by Robert Juniper entitled ‘Desert Landscape’, is rather enticing. Juniper is a West Australian artist of “poetic and spontaneous vision” best known for his evocative landscapes. His work is represented in the collections of most major Australian galleries as well as being collected privately. This entry was posted in Garden Design, Landscape Architecture, public art on 2nd January 2009 by Christine. There is a particularly attractive spiritual quality about water and its many moods from calm to stormy. 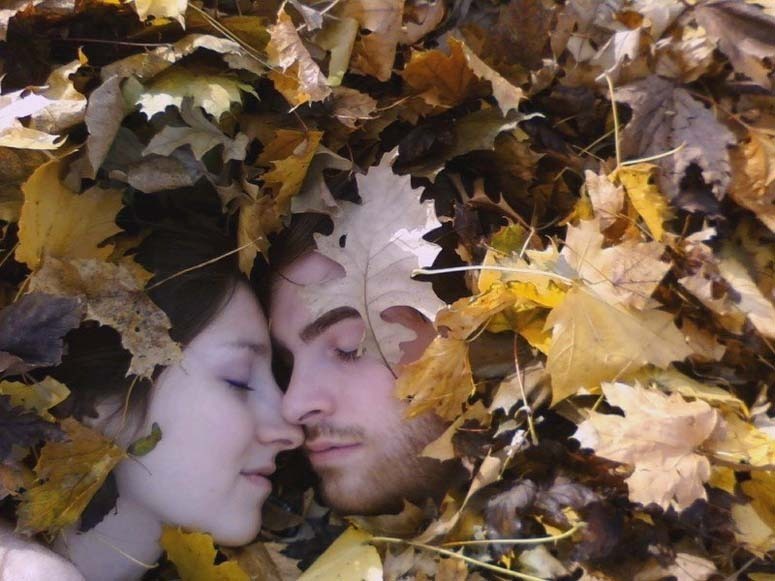 As such, it is the perfect location for a ephemeral labyrinth…. This labyrinth appears to be modelled on the seven ringed Scandinavian ‘trogaburg’ labyrinth, usually constructed by placing stones. 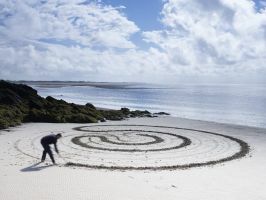 It is said that these labyrinyths were almost always constructed close to the coast line. It is supposed that they were used by fisherman to trap ‘malevolent’ spirits within the labyrinth before setting out to sea! This entry was posted in context-sensitive design, Landscape Architecture, Sustainable design on 2nd January 2009 by Christine. 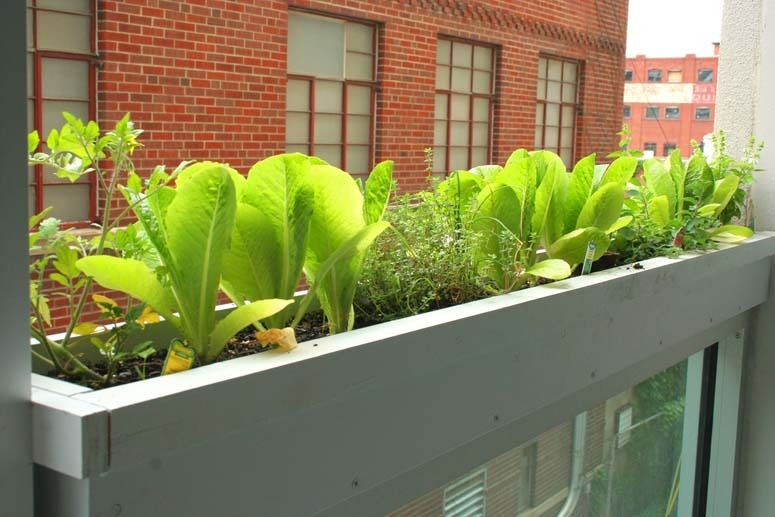 More useful gardens: gardens should be used to grow more food. More beautiful gardens: pay no attention to what is seen in garden centres (unless the garden centre employs talented garden designers to layout their stores). Should every kitchen should have a window and every kitchen window should have a box for growing herbs? This entry was posted in Garden Design on 1st January 2009 by Tom Turner.